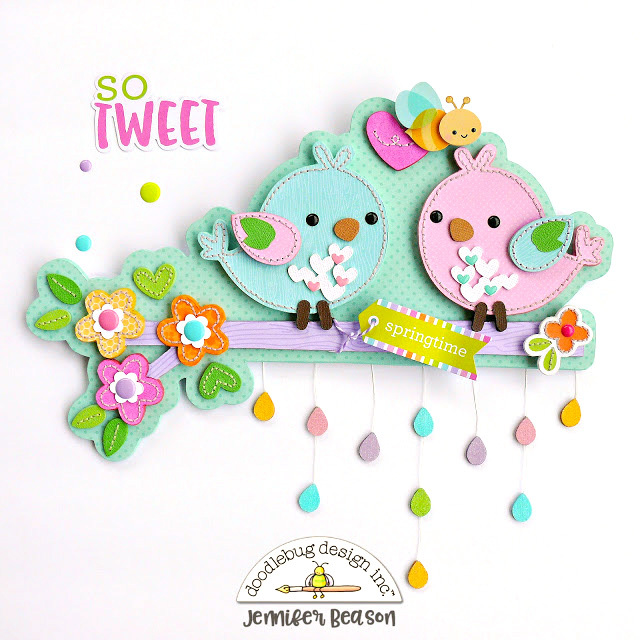 Spring is finally here and what better way to celebrate than to create a "tweet" wall hanging. 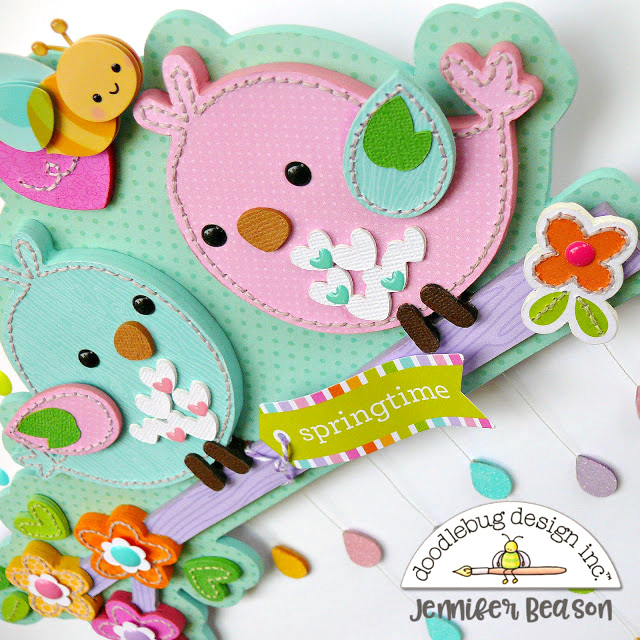 These cute lovebirds were made using the Simply Spring collection and a coordinating cut file. For the smaller pieces, like the flowers, leaves and birds I used layers of chipboard. 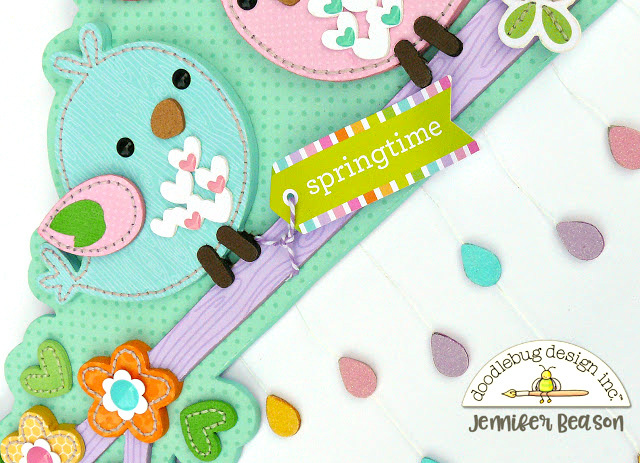 All the pieces were covered with patterned papers from the Simply Spring collection, ﻿textured cardstock or Petite prints. The chipboard pieces were stitched with embroidery floss for some added detail and then layered on to the wood cutouts. 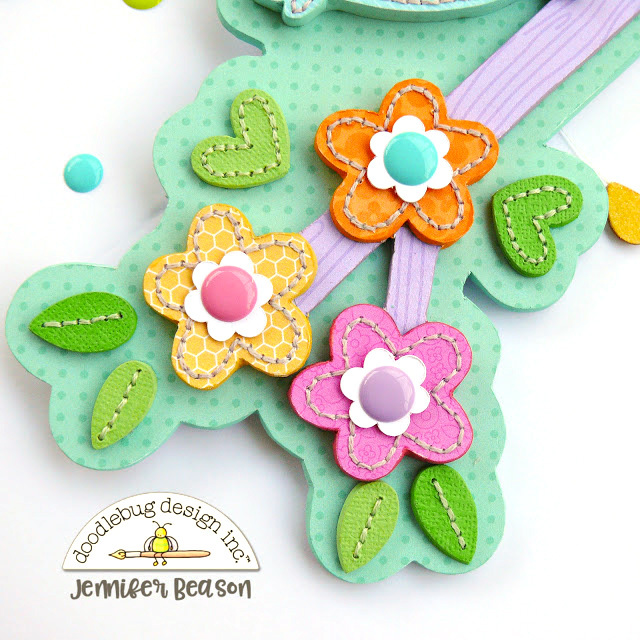 I loved the bumble bee Doodle-pop and added him to the chipboard heart. I also used some heart shaped sprinkles on each bird's chest and round ones for their eyes. Below, you can see I used some larger sprinkles in the center of the flowers as well. Some twine was used to tie my "Springtime" title in place. To finish off the project I decided to add a few colorful raindrops. The chipboard raindrops were covered with cardstock on one side and attached to some thread. Once dry the other side of the raindrops were covered with cardstock and then both sides were covered in glitter. Other Supplies: 1/8" MDF, chipboard, embroidery floss, glitter, thread, paint. This is just the cutest!! You never cease to amaze me! As soon as I saw this on Pinterest, I knew that the artist must be Jennifer! She is so talented. I love her work! !